TORONTO (Sep. 15) — And, so, the wait(s) continue. Plural. 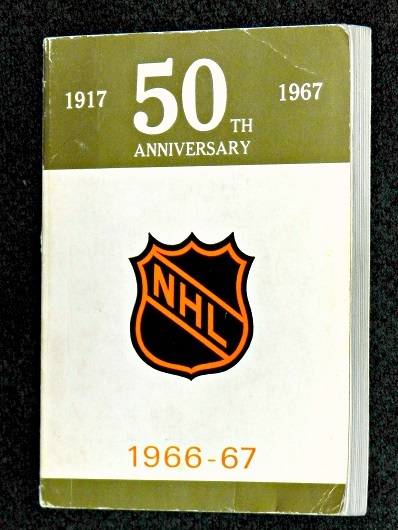 Fifty–one years and counting for a Stanley Cup. Forty years and counting for a Norris Trophy–caliber defenseman. Any person that believes the two aren’t related with respect to the championship drought of the Toronto Maple Leafs is dreaming in technicolor. This oft–repeated subject came to mind on Thursday, when Toronto’s lone chance to acquire its long–missing piece on the blue line evaporated. San Jose adroitly moved in and snagged two–time Norris winner Erik Karlsson from the Ottawa Senators. Prior to ankle surgery in the summer of 2017 — and during Ottawa’s implausible run to the Eastern Conference final that spring — Karlsson was not only the best defenseman on the planet, but the best player. Period. He scuffled a bit last season after the operation to remove “half my ankle bone” (as Erik described it); if you can call nine goals and 62 points in 72 games from the back end a “scuffle”. For blue–liners all over the league, such numbers would represent a career year. By Karlsson’s lofty standards, however, it was a fall–off… from golden seasons of 82, 78, 74 and 71 points. Defensemen of this caliber are almost–never available — via trade or free agency. There are simply too few in the National Hockey League; the laws of supply–and–demand encourage teams to lock up such players over many years. Current examples include Drew Doughty (Los Angeles); Kris Letang (Pittsburgh); Oliver Ekman–Larsson (Arizona); Victor Hedman (Tampa Bay); P.K. Subban, Roman Jossi, Ryan Ellis (Nashville); Brent Burns (San Jose); Alex Pietrangelo (St. Louis). Karlsson is at least as–gifted (likely more–so) than any of the aforementioned. Yet, he’s been traded for a package of young players that considerably underwhelms. None of Chris Tierney (career–best 17 goals), Rudolfs Balcers (who?) or Dylan DeMelo (zero goals in 63 games with the Sharks last season) are as accomplished as young William Nylander of the Maple Leafs (48 career goals; 61 points in each of the past two seasons). The same William Nylander entrenched in a contract squabble with rookie general manager Kyle Dubas; the Swedish winger absent from training camp while apparently demanding eight years as a restricted free agent. I will therefore repeat — with emphasis — that Ottawa could not have possibly landed a more–rewarding kingpin in a trade for its best player. Karlsson–for–Nylander was out there all summer, with neither party (Senators nor Maple Leafs) evidently interested. Such a swap would have lifted the forward–engorged Leafs to the apex among Stanley Cup favorites. While re–building Ottawa would have procured a likely 40–goal scorer. Instead, Toronto soldiers on without a No. 1 blue–liner (as it has since Borje Salming, in 1978) while Ottawa is left to hope that Balcers and two conditional draft picks prove worthy of Karlsson. In my view, a colossal waste… at both ends. Leave it to the enterprising Doug Wilson, GM of the Sharks, to appreciate the requirement of a mobile, gifted blue–liner. During his excellent playing career (1977–93) — mostly with Chicago — Wilson had seasons of 85, 76, 73 and 69 points. His 39 goals in 1981–82 still ranks fourth, all–time, among NHL defensemen, behind only Paul Coffey (48 in 1985–86); Bobby Orr (46 in 1974–75) and Coffey (40 in 1983–84). The blue–line tandem of Karlsson and Burns should be the most–prolific in the NHL; deadly while on the powerplay. Many in the mainstream media, particularly here in Toronto, are convinced the addition of John Tavares puts the Maple Leafs at or over the top in Stanley Cup contention. The betting website gamingtoday.com (as of Thursday) lists only Tampa Bay (at 7–1) ahead of Toronto (8–1) in odds to win the NHL title. And, there’s no question the Leafs — with Tavares, Nylander, Auston Matthews, Mitch Marner, Nazem Kadri and Patrick Marleau — are more loaded up front than at any time in the post–1967 era. So, perhaps the club can score and puck–possession its way to a championship. Given, however, that most scoring thrusts begin on the defensive side of center–ice, I say the Leafs are still living dangerously. And, a former NHL coach that didn’t wish to be identified (yet one that everyone in hockey knows) told me last week he questions whether Toronto “has a playoff–caliber goalie.” Certainly, Frederik Andersen will not be playoff–worthy if Mike Babcock follows through with his ill–conceived plan to again start him in 65–plus games. Otherwise, the jury is still out on the Big Dane, who was too tired to lift Toronto past Boston in the opening round last spring. 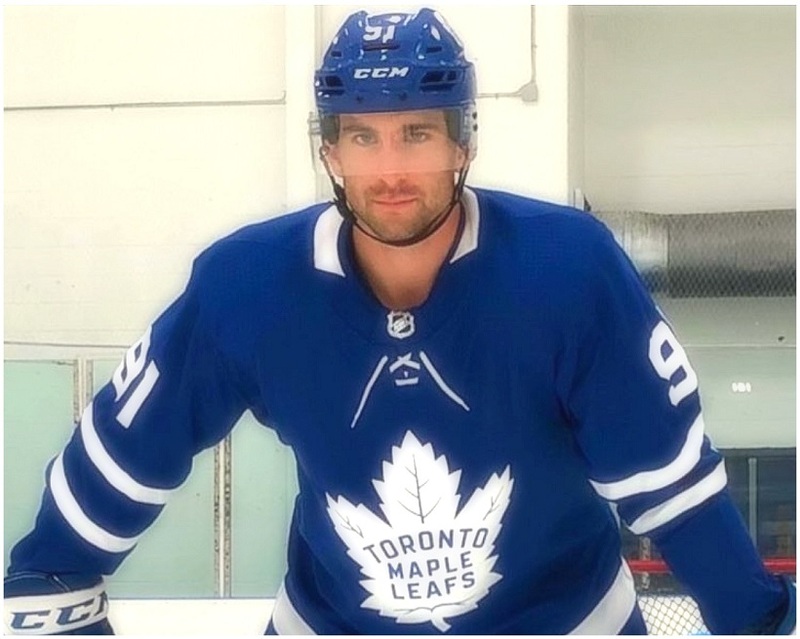 THE BIG OFF–SEASON CATCH: JOHN TAVARES, IN FULL MAPLE LEAFS REGALIA. If relatively healthy, the Leafs of 2018–19 will be an explosive, entertaining team — likely amid the top half–dozen in the NHL. The signing of Tavares ranks mong the seminal moves in modern franchise history. But, that long–missing component on the back end (plus a fatigued goaltender) will continue to haunt the Blue and White. And, in my view, prevent the club from ending its interminable Stanley Cup drought. 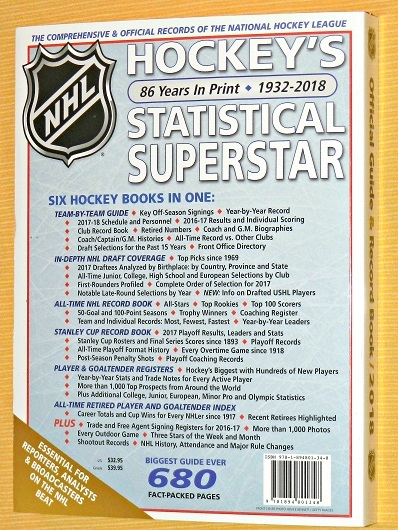 In a melancholy move, and despite unparalleled revenue growth, the NHL has chosen to discontinue publication of its annual Guide & Record Book, ending a streak that began in the 1932–33 season. 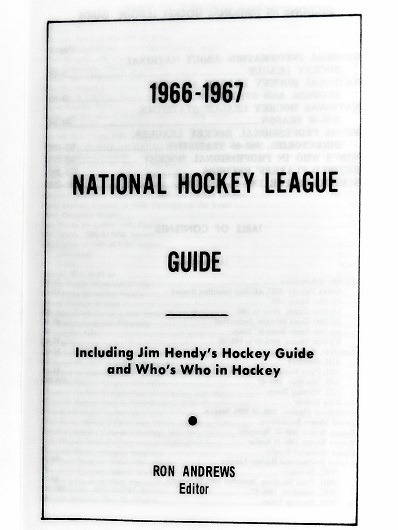 Though perhaps inevitable — in the past decade, most NHL teams have stopped publishing media guides, limiting information to a PDF–computer format — the league guide soldiered on, ballooning to 680 pages in an 11 x 8½–inch colossus a year ago. 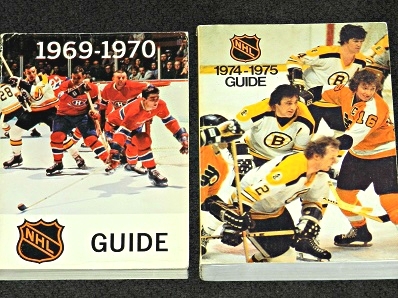 This dimension began in 1984–85, enlarging the Guide from its pocket–book, 7 x 5–inch measure of previous years. 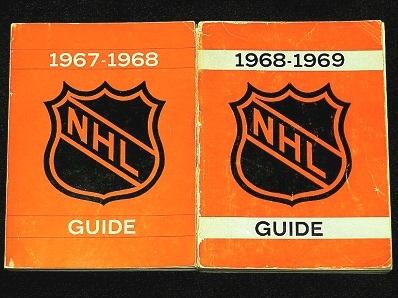 With facts and information now confined to the Internet, the physical NHL Guides (particularly those from the 1960’s onward) become part of hockey memorabilia. If you have yours, in good condition, hang on to them as collector items. 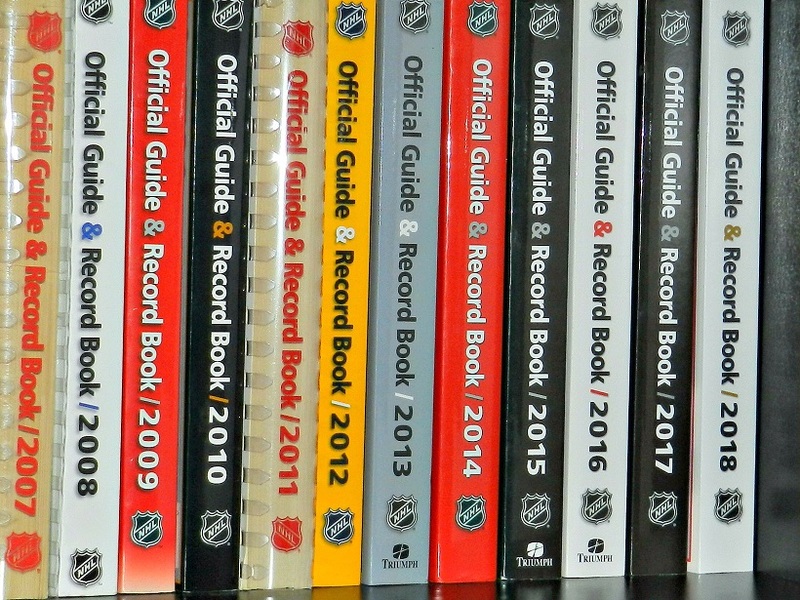 ON MY OFFICE BOOKSHELF: THE FINAL DECADE–AND–A–BIT OF THE NHL GUIDE & RECORD BOOK. 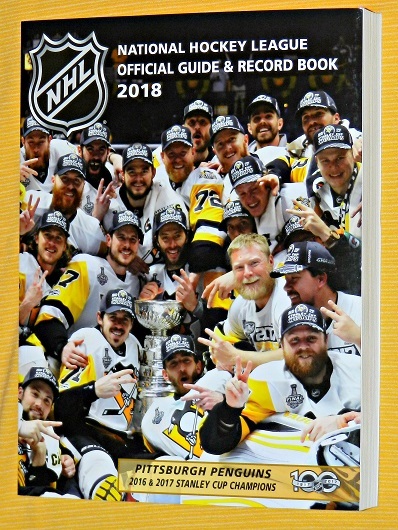 AS IT TURNED OUT, THE LAST EDITION OF THE NHL OFFICIAL GUIDE & RECORD BOOK. 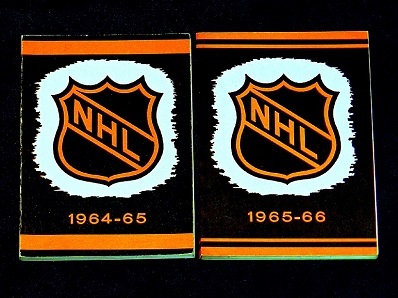 FROM THE NHL’s EXPANSION SEASON OF 1967–68, WHEN THE LEAGUE DOUBLED IN SIZE, ADDING THE CALIFORNIA SEALS, LOS ANGELES KINGS, MINNESOTA NORTH STARS, PHILADELPHIA FLYERS, PITTSBURGH PENGUINS AND ST. LOUIS BLUES. 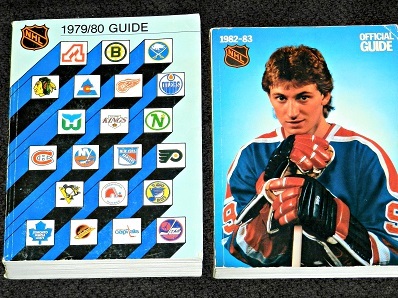 AS MENTIONED, THE NHL GUIDE WAS ENLARGED TO AN 11 x 8½–INCH FORMAT IN 1984. FROM THE YEAR THERE WAS NO NHL — THE LOCKOUT SEASON OF 2004–05. Ok, I am a fanatic, and I do remember Molson Pleasure Pak. I am reading Zaitsev is pumped and ready after missing six weeks from a broken ankle and never making a full recovery. Then you have Rielly going from 27 points two years ago to 52 last year. He’s 24 so make that improvment again and he is in Karlsson numbers. Maybe, just maybe the Leafs defense is not as bad as you think. That said I would have loved Karlsson on the Leafs if all it took was a bag of use pucks and and a few picks along with Josh Leivo. On a sad note, my die-hard Sens fans buddies don’t seem to want to talk hockey anymore. I am not sure you appreciate how much Ottawa’s fans hate the Toronto Maple Leafs. The Maple Leafs fans might show up when the Leafs play the Sens, but the Sens fans still remain behind. If Dorion had traded Karlsson to Toronto for anyone but Auston Matthews (and perhaps even then), fans would have run Dorion out of town and Melnyk’s ownership would be even more strained than it currently is. In my opinion, there never could have been a deal between these two clubs. I covered Leafs-Ottawa games for 20 years, Aaron, home and away. I think I understand. BTW, try to remove “hate” from your vocabulary. Too harsh a word. And, if you’re a GM and you want to keep your job, you make the best deal possible. Which I’m certain Dorion did. Still, he received nothing close to Nylander, which would have been a fair swap for Toronto and the Senators. Thanks for the response. I certainly respect your experience, yet I stand by the assessment. It’s not simply covering the games; it’s speaking/listening to the Ottawa fans and listening to their sports radio stations…when the Leafs are not in town, yet remain the subject of discussion. It’s hearing the fans cheer when the Leafs are announced to be losing in Scotiabank Place (now Canadian Tire Centre). Hate means “intense or passionate dislike.” That aptly describes the feeling of Ottawa Senators fans for the Toronto Maple Leafs hockey team. As a result, the best deal is not a simple definition: swapping one of the top players in the game and the second greatest player of your team’s history (next to Daniel Alfredsson) to a rival team that your fans hate is very hard to consider in any way as the best deal. There never could have been a deal between these teams for a player the caliber and status of Karlsson. 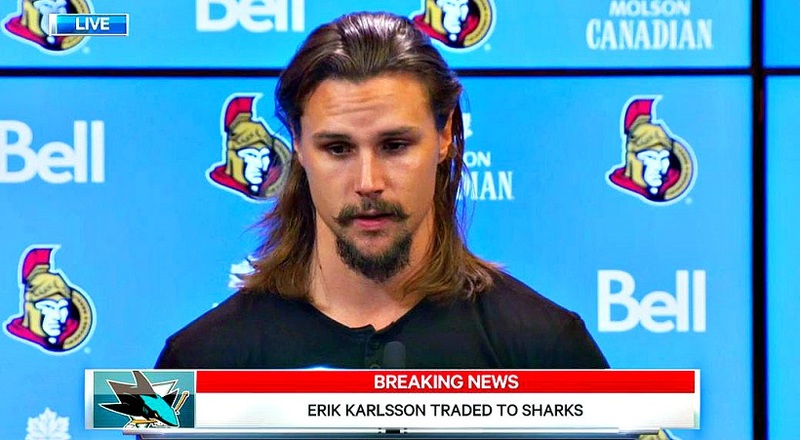 Karlsson may want to go to free agency which is why his trade value equated the price of a happy meal. At any rate I’m looking forward to reading your columns this year Howard. I’m the most optimistic / bullish about Leaf hockey since just prior to Peddie forcing Pat Quinn to decide on coaching/gm’ings and then hiring JFjr. No disrespect to Jr who is a good hockey man but he’s no Pat Quinn. Seriously you ought to approach BCE & Rogers and ask them for permission to write a book about this upcoming season – which is really just a backdoor wormhole to get them to give you some money and get you into the games for free. Thanks for the kind words, John. But, I am gainfully (and happily) employed.